Early television work includes “Steptoe and Son”, “The Persuaders”, “General Hospital” and “Coronation Street”. She played “Purdey” in twenty-four episodes of “The New Avengers” and recorded thirty-four episodes of “Sapphire and Steel” both programmes are constantly being transmitted world-wide. Her experiences of living alone on a desert island were filmed for a BBC Special “Girl Friday”. 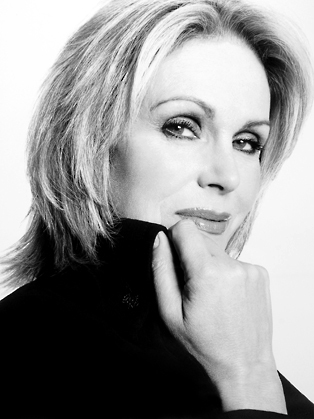 Joanna is probably best known on television for her hugely popular role of ‘Patsy’ in the award winning series “Absolutely Fabulous” for the BBC. Other recent television includes: “Class Act” (2 series) for Carlton; “Coming Home” and “Nancherrow” (both 2 part dramas) for Portman. In 1996 she travelled to Bhutan to film a journey made by her grandparents “In The Kingdom Of The Thunder Dragon”; “A Rather English Marriage” (nominated for a BAFTA as Best Actress in a Drama - 1999) and “Dr Willoughby” for Pearson. 2002 saw her recreate her ‘Patsy’ role in “Absolutely Fabulous” and then again in 2011 and 2012. In January 2005 she filmed a new series for Baby Cow entitled “Sensitive Skin” followed by a one hour special about the plight of the orang-utan for Tiger Aspect. In 2006 she filmed “Jam and Jerusalem” and a second series of “Sensitive Skin”. She has written five books ”Stare Back and Smile” (autobiography) “Forces Sweethearts”; “Girl Friday” and “In The Kingdom of the Thunder Dragon” both from the BBC films. Her latest book “No Room For Secrets” was published in October 2004. Among the many charities she supports are The Princes’s Trust, SightSavers, The Born Free Foundation, Thames Reach Bondway, Ataxia and The Gurkha Welfare Trust. She is a self-confessed Bond fan and of his creator Ian Fleming, being very proud of her role as a 'Bond Girl'. In April 2009 she became the spokeswoman for the Gurkhas in the UK and was instrumental in persuading the British government to allow Gurkhas who had served in the Army the right to settle in the UK. When she visited Nepal in July 2009 she was treated as a heroine and a goddess by crowds of people on the street, and was thanked by Nepal's President and Prime Minister for her work in championing the Gurkhas' cause.